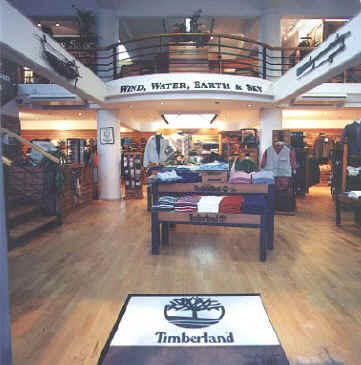 The world of Timberland is far greater than you imagine, embracing the outdoors from sunglasses, socks, packs, travel gear and watches. Isn't it time you discovered our world? If you need warm, comfortable clothing or footwear whilst in Cyprus, we will be pleased to welcome you to browse in any of our outlets. If you wish to go skiing whilst here or romp in the woods, we have what you need. As part of our paths of service program, each Timberland employee receives 40 hours of paid time a year to volunteer in their community. By 2000 we performed over 80,000 hours of service. Pull on your Timberland boots and join us. Shopping in Cyprus with confidence. Please see these websites to see what hosting opportunities we offer. We appreciate feedback, comments and commissions, contact us by clicking the conductor to E-mail us. PO Box 40218 Larnaca. Cyprus. Original photography credits.. Jocelyne Daue-Vienne ..with thanks. Others are in house or credited individually. Any pics you have of interest are gratefully received.